Barbara Wilson’s floral and gift shop, Blooming Gardens, has been blossoming for years and is one of the few florists in the Cutler Bay/Palmetto Bay area to survive the recent bad economy. Wilson has a passion for what she does. Blooming Gardens is located at 20462 Old Cutler Road (behind the Shell gas station) and is open six days a week. Its hours are 9-5 Monday and Wednesday, 10-5 Tuesday and Thursday, 9-6 Friday and 9-4 Saturday. Wilson says that she and her staff get a lot of repeat business from customers who are happy with her work. “We give excellent customer service and treat everybody like extended family,” she said. Blooming Gardens is a full service retail flower and gift shop that specializes in fulfilling all customer requests. They always have custom, fresh-cut floral designs in every price range and keep a cooler full of carnations, daisies, multiple colors of roses, and a wide variety of exotic flowers such as larkspur, peonies, lilac, hydrangea and lilies, in addition to assorted tropical blooms as seasonally available. We offer personal attention, individual designs, quality work and more. We are members of the Society of American Florists, Greater Kendall Business Association, Palmetto Business Association, Pinecrest Business Association, Cutler Bay Business Association and Business Network International (BNI). We also work with the March of Dimes, Camillus House and area community groups and schools on a regular basis. Wilson’s attractive and comfortable shop offers baskets, vases and containers in many sizes, shapes and colors and can also arrange to have your selection delivered worldwide. There’s fresh fruit in season, such as pineapple, apples, pears, oranges, starfruit, grapes, kiwi, mango and much more that can go into an irresistible gift basket for someone special. Gourmet foods, including a selection of imported cookies, crackers, cheese, spiced nuts, seasoned pretzels and flavored coffees and teas can also added for basket fillers. A large variety of chocolates including Godiva and assorted candies are also available. Blooming Gardens also has gift items of all types, so you can stop in and pick up a teddy bear for the new baby in the family or choose from their large selection of other plush animals including Ty beanie babies, Webkinz and musical plush. There are scented candles and unusual candle holders on display, in addition to candle lamps and decorative candle houses from Clayworks. There is also a varied selection of decorative home accessories such as stained glass vases and nightlights, and inspirational garden stones. Wilson got into the business she now loves almost by accident. She recalls how it began. Wilson, who grew up in Miami and came from a business family here, says most new customers come in saying that they never knew that there was a florist there. 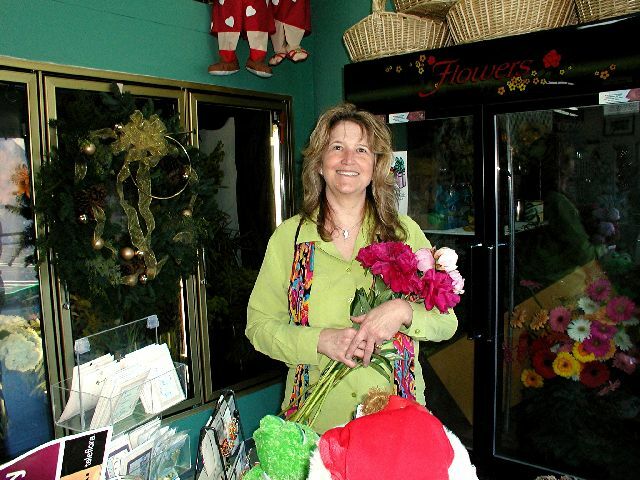 While other floral businesses in the area have closed their doors, some after several decades in business, Wilson’s small business has managed to keep operating through, in most part, the perseverance and astute diligence of its co-owner and operator, as well as her dedicated and skilled staff of two part-time designers and one part-time driver. Active in her community, Wilson works with local agencies, from various community councils and network groups, to the support of local public schools and their career days. She has donated floral arrangements and gift certificates for luncheons and awards ceremonies throughout South Dade. The shop’s arrangements, many of which she creates personally, are of the freshest flowers and highest quality. Her dedication to providing the best possible service to her craft is obvious to anyone who has had the pleasure of receiving an arrangement from her shop or has spoken with her. While people are cutting back on some expenses, flowers are still one of the best ways you can let someone know that you care about and appreciate them. Wilson also creates balloon bouquets and handles weddings, parties and corporate accounts. For more information, contact Barbara on the web at www.bloominggardens.net or by telephone at 305-256-2772.